Is Alabama’s Texting And Driving Ban Effective? Is the ban on texting and driving in Alabama effective? In a recent post, I discussed two shortcomings with Alabama’s current distracted driving law. Our current law is limited in application. Our current law applies to portable devices removable from the car. And, it applies simply to texting or typing activities. As I discussed in my prior post, the use of electronic devices has expanded far beyond simple texting or typing activities. In our practice, we’ve seen accidents caused by drivers actually surfing the internet while driving. We even had one client hurt by a driver who was watching a movie on a portable device while operating a car. 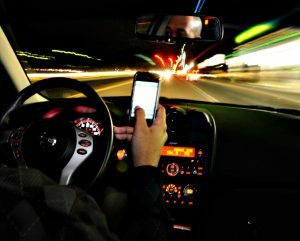 Our law should be written to encompass unreasonably dangerous distractions beyond the simple act of texting. I understand – we cannot anticipate every bad act. But, we can keep the law up to date with advances in how people use portable devices. Our current law contains minimal penalties. What is the first-time offender penalty for a texting and driving citation? It’s $25. The penalty for texting and driving in Alabama provides almost no deterrent to drivers. One Birmingham channel, WBRC, recently investigated the effectiveness of Alabama’s texting and driving law. As part of its investigation, WBRC researched traffic accident statistics in Jefferson County. The channel then published an article titled Phones in the fast lane: Investigating how effective Alabama’s texting and driving ban is. The WBRC research is interesting. Despite a 2012 texting ban, annual accident numbers in Jefferson County and several of its cities have continued to increase. I’ve asked in prior blog posts — Why do accident numbers continue to rise despite the fact both cars and roadways are safer today? I believe distracted driving is the reason for the increase. The numbers provided by local law enforcement agencies to WBRC do not tell us which accidents were actually caused by distracted driving. You can see the number of distracted driving accidents actually dropped slightly in the first full calendar year after the texting ban became law, but it’s jumped every year since. State statistics keepers warn these numbers aren’t telling us how big the problem really is. Do the statistics under-report dangerous distracted driving? I’ve made that argument in prior posts. I believe many car accidents are caused by un-reported distracted driving. I believe the true numbers are much, much higher. Why do I believe this? While I don’t have statistics, I do hear the stories of injured clients every day. I talk to injured people. I talk to accident witnesses. I take depositions from the drivers who caused crashes where I ask them questions under oath. Our firm specializes in personal injury cases and many of these injuries are caused by distracted drivers. I’m convinced the number of crashes actually caused by a distracted driver is far higher than reported. We know distracted driving numbers are higher than what the actual reports show. Those are strong words from an accident researcher. I agree. Distracted driving is a huge problem – bigger than reported. We can reduce the problem of distracted driving through a combination of activities. We need to educate young drivers on the danger. We need to promote technology in phones and cars that can prevent distraction. And, we need a law that takes the danger seriously.